I am happy to announce that I have just released MacHg 1.0.1. 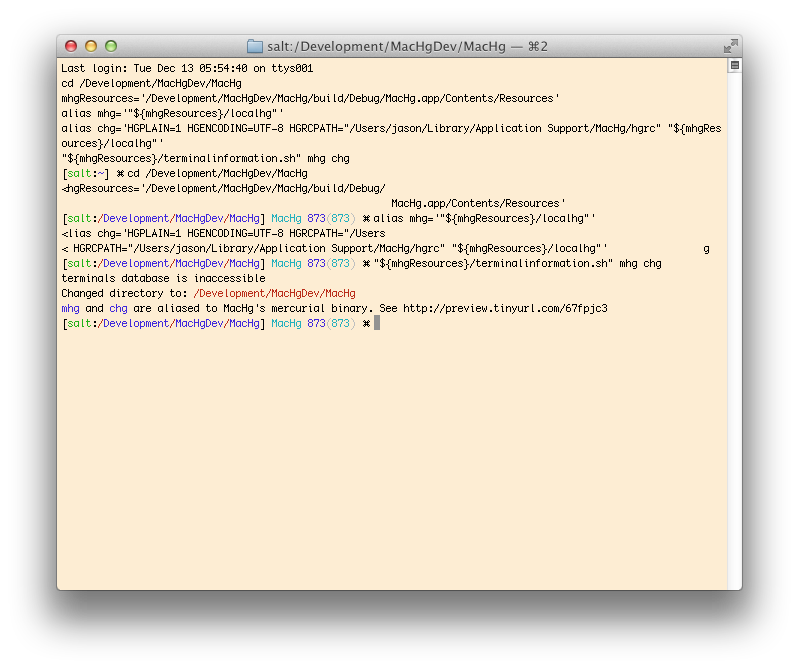 MacHg 1.0.1 updates MacHg to fix Yosemite compatibility issues. Under the hood things have massively changed and MacHg now uses ARC rather than garbage collection for it’s memory management. Subjectively, it feels a good bit snappier because of this. It is finally code signed, so you don’t need to add a security exception to install it. There are a number of other nice fixes in MacHg 1.0.1. Take a look at the full change log for details! As a personal note, sorry for the massive delay in development here. My real world job has been very very busy and demanding, and I haven’t had as much time to devote to MacHg as I would have liked. However, with Yosemite MacHg started to crash on startup so I have now dug into it and put in the effort to release a new version. Enjoy! That not clearing of the terminal commands happens due to clear no longer working. If you do some googling it turns out the culprit seems to be an XCode 4 update for me. It handily blew away some of the files in /usr/share/terminfo/78 specifically it removed the configuration file xterm-256color. Restoring this file from time machine or another Lion install will restore the clear command and will stop some other funkiness I was seeing in the terminal. In pacifist navigate to and extract the file /usr/share/terminfo/78/xterm-256color to the same place on your hard drive. Copyright © 2014 Abiding Development. Powered by WordPress and A Dream to Host theme by Art of Blog.